Sometime before Christmas 2016, I was approached by an acquaintance asking me if I was interested in doing a review of Cryptosteel. 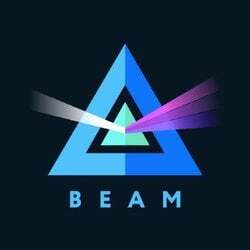 Having previously reviewed the Trezor, Ledger and Keepkey, I agreed to do the review as I have read interesting things about the Cryptosteel. 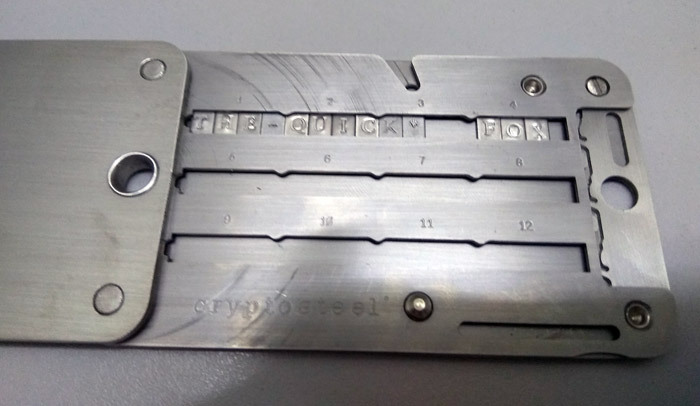 Cryptosteel is a cold-storage wallet that allows for storage of sensitive information such as Bitcoin private key / mnemonics sentence, Lastpass Master Password, and banking password in a tool that is indestructible by elements such as fire, pressure, corrosion and acid. It is made of stainless-steel and has engraved metal tiles for you to arrange your password in the cold wallet. Delivery of the product took a few weeks to reach from Poland. 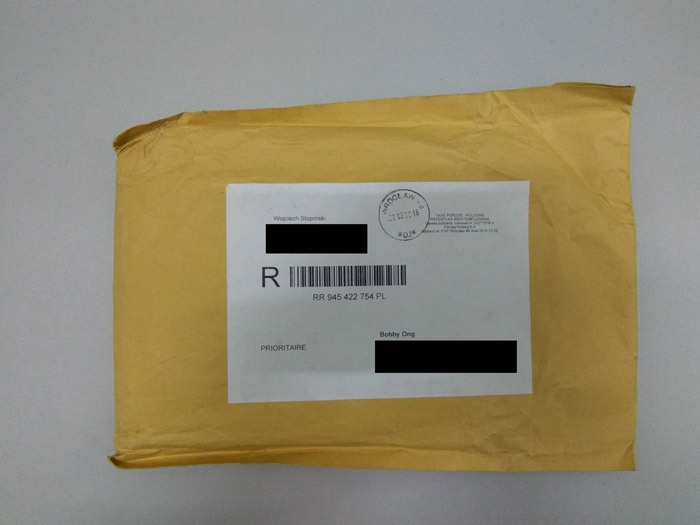 The creator of Cryptosteel, Wojtek Stopinski sent the parcel which has a nice weighty feel to it. 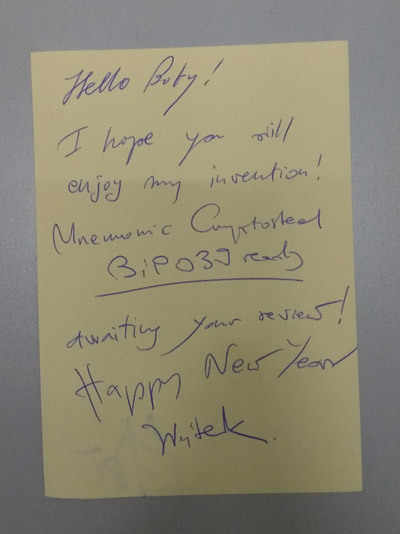 Wojtek was pleasant in writing a Happy New Year note for me to accompany the Cryptosteel Mnemonic that he sent. 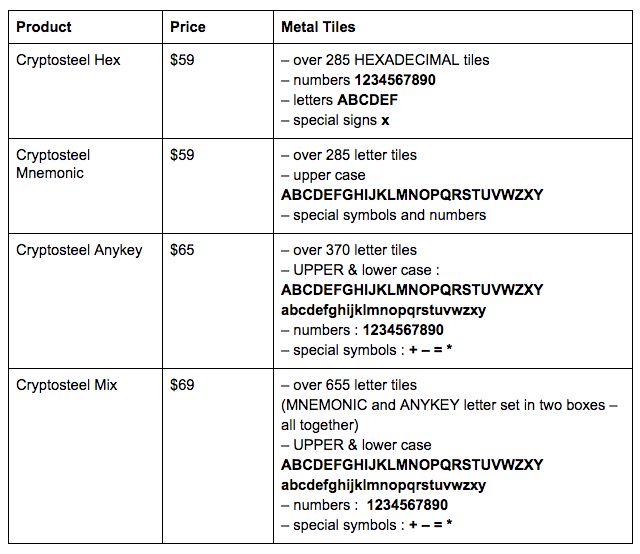 In my research, I found that Cryptosteel has 5 different products, namely the Cryptosteel Hex ($55), Cryptosteel Mnemonic ($59), Cryptosteel Anykey ($65), Cryptosteel Mix ($69) and Limited Edition Cryptosteel Open Source Launch Bundle ($999). The last item is a collector’s edition featuring a signed print by Cryptosteel’s contributing artist Rafael Akahira. 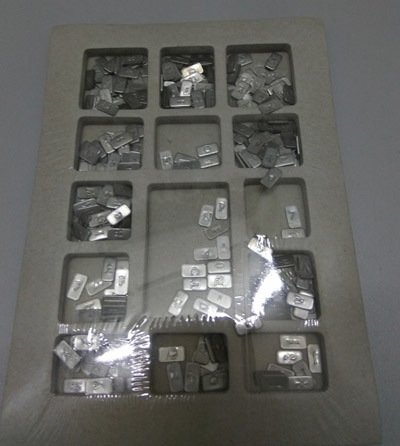 The Cryptosteel website stated that if you are unsure on which Cryptosteel to purchase, the best bet is to buy the Mix as you can then assemble any Master Seed, private key, mnemonic sentence and hexadecimal key. 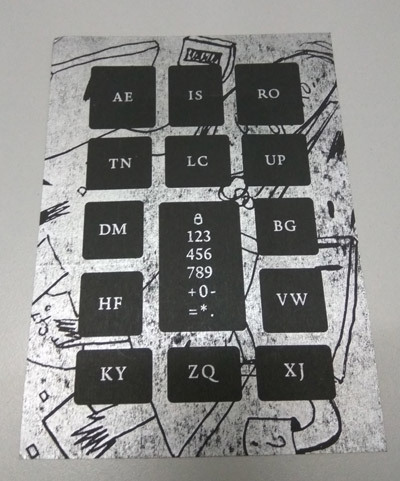 While doing the review I did not realise that there are 4 different products and it took me a while wondering why there were only uppercase letter tiles in my Cryptosteel. It was only later that I realised the product that I received was the Cryptosteel Mnemonic. I had earlier spent some time researching if Bitcoin private keys are case-sensitive (they are) and soon realised that the Cryptosteel Mnemonic is meant to be used with BIP39 mnemonic code. BIP39 in short allows for the creation of a series of words that can be used as binary seed (12 words) for the generation of deterministic wallets. 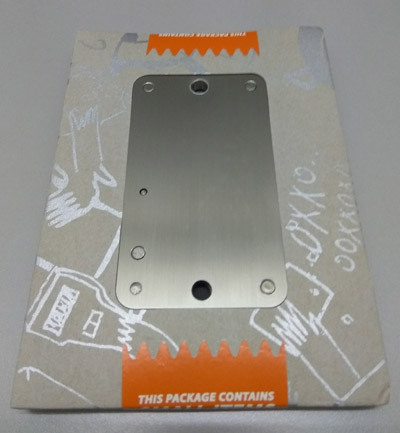 Continuing the review of Cryptosteel, this is how it looked once I removed the envelope. 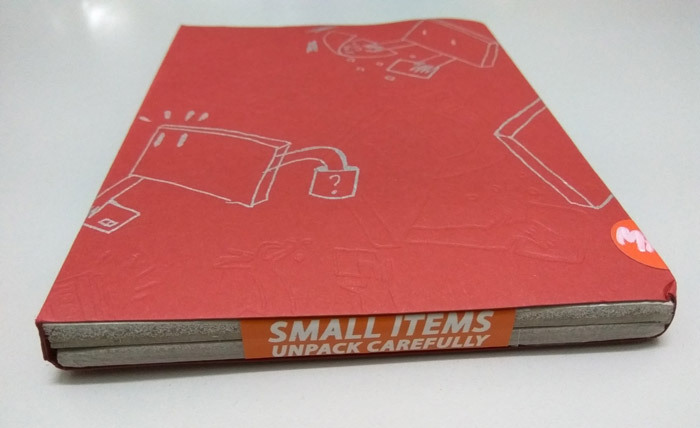 There was a warning saying that it contained small items and I should unpack carefully. I removed the red sleeve and this is how the Cryptosteel looked. There was this card that was attached that did not make any sense to me in the beginning with the bunch of random characters appearing everywhere. Only after watching a Youtube review did I realise that the characters were where the letter tiles were placed. Honestly, the card was pretty useless as my tiles were all jumbled up by the time I received it. You will notice that the tiles sent to me were on an open-ended cardboard. Since I did not use all the metal tiles, the remaining tiles were difficult to store without a lid covering them. I proceeded to add my password on the Cryptosteel. There were basic instructions on the packaging but I was totally confused by it and had to spend 10 minutes watching Youtube videos to learn how to open up the Cryptosteel. The Cryptosteel slides open into two sides allowing for the storage of two wallets. Each side allows for the storage of 12 mnemonic seed words of four characters long. Some seed words are longer than 4 characters but this is not something to worry about as the BIP39 wordlist has been created in a way where it is enough to type only the first four characters of the seed word for it to be identified. Overall, I really like the product that I received. The Cryptosteel feels sturdy and I can definitely see how this product can survive all kinds of natural elements like fire, pressure, corrosion and acid. My friend, Ofir Beigel of 99Bitcoins did a really cool video trying to destroy his Cryptosteel. You would find it enjoyable watching him do it. The best part is the Cryptosteel works as promised and the tiles are still readable after everything he put it through. 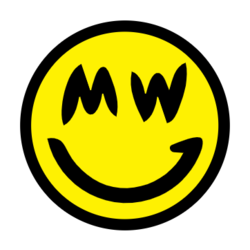 In short, the Cryptosteel is a product that appeals to cryptocurrency users who would want to have ultimate security in backing up their mnemonic sentence and private keys. The entire process is done offline so there is no risk of an online security breach. I would recommend the Cryptosteel if you have a large cryptocurrency holding as it offers more security compared to writing down your mnemonic sentence on a piece of paper.